The eMi year is divided into three project “season” cycles: January/February (Spring), May/June (Summer) and September/October (Fall). The months in-between are filled with both follow-up work on reports and drawings as well as preparations for the next project cycle. Every few cycles each staff team leader will take a break from project leading in order to get caught up on project work and have some time for shared office administration duties. After three straight projects in 2006, Greg took the Spring Cycle (which in Calgary is something of a misnomer) off from project leading in order to complete an extensive report for Zambia and also spend time “growing” eMi Canada with participation in Missions Fests in both Vancouver and Edmonton. In Vancouver Greg had the opportunity to speak at several youth and adult seminars and although these were not strictly to promote eMi, they did give further exposure to who we are and what we do. In Edmonton Steve had an opportunity to speak directly about eMi at a special seminar session. Steve and Greg were aided at both conferences by past volunteers and interns (Olwen, Johnny, Freeman, Donald, Rui and Tommy), a present part-time staff (Patrick Cochrane) and in-coming full-time staff (Kevin Wiens). 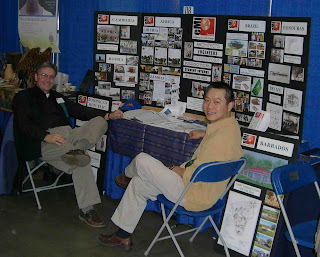 Their participation at the booth helped give Steve and Greg breaks (Saturdays were 13 hour days) and Greg the opportunity to speak at the seminars. Thanks! We met literally hundreds of people, from those who were eager to be personally involved to many spouses, parents and friends of architects, engineers and those of other related fields. “Oh, I gotta let _____ hear about this” was an often heard phrase. 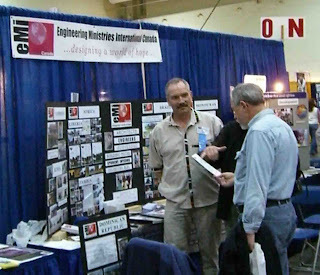 Each Missions Fest we have participated in has resulted directly in the participation of new project volunteers and great connections with numerous potential ministry clients seeking our service. We intend to continue our participation in these conferences so make a point of coming to see us the last weekend of January in Vancouver (Canada Place) and the final weekend of February in Edmonton (Shaw Conference Centre). As we gain new staff and resources we plan to expand our presence to other Missions Fests across Canada.